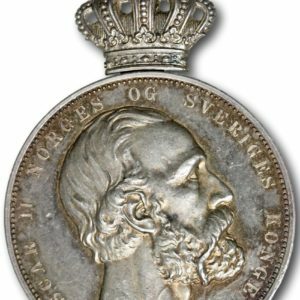 King Oscar IIs Medal for Noble Deed 2nd Class. Engraver: Ivar Throndsen. 403 recipients were awarded this medal for saving lives. The medal is in a very good condition with frosted bust. Reference: Hallberg II 8. King Oscar IIs Medal for Noble Deed 3rd Class. Engraver: Ivar Throndsen. 689 recipients were awarded this medal for saving lives. The medal is in a very good condition. Reference: Hallberg II 9. 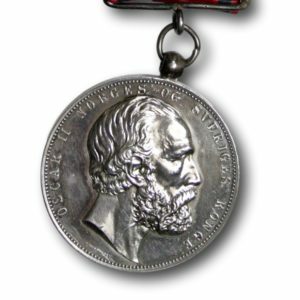 King Oscar IIs Medal for Noble Deed 3rd Class. Engraver: Ivar Throndsen. 689 recipients were awarded this medal for saving lives. The medal is in very good condition. Reference: Hallberg II 9. 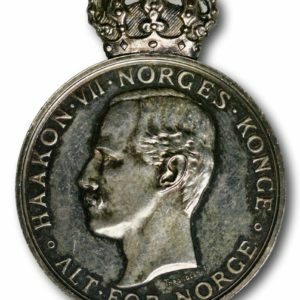 King Haakon VII’s Medal for Noble Deed 2nd Class (1905-1957). Engraver: Ivar Throndsen. 855 recipients were awarded this medal for saving lives. The medal is in very good condition. Reference: Hallberg II 11. 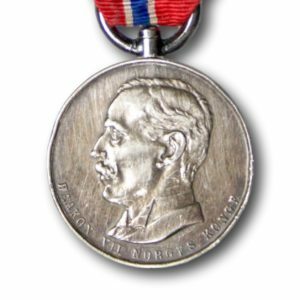 King Haakon VII’s Medal for Noble Deed 2nd Class (1905-1957). Engraver: Ivar Throndsen. 855 recipients were awarded this medal for saving lives. Ribbon with attachment is not attached to the mounted medal. Reference: Hallberg II 11. King Olav V’s Medal of St. Olav (miniature) 1959-1991. Engraver: Halfdan Rui or Yngvar Thoresen, Oslo. 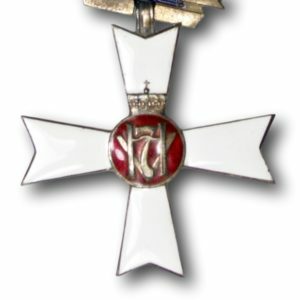 550 people were awarded King Olav V’s Medal of St. Olav. Many of those were foreigners. 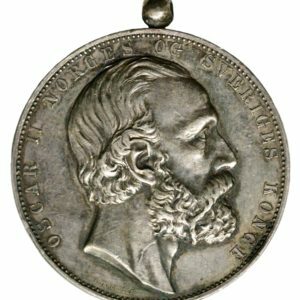 Collection of medals awarded Anders Thomassen. The medals are King Haakon VII’s Medal of Merit (1908-1957) in gold and two silver medals for loyal service. Original boxes included. Reference: Hallberg II 31 Gull, Støren & Holst 30, 100. 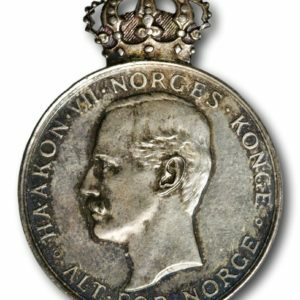 King Haakon VII’s Medal of Merit (1908-1957) awarded to Chr. H. Fjeld i 1946. Original box included. Both box and medal are in very good condition. Reference: Hallberg II 32. 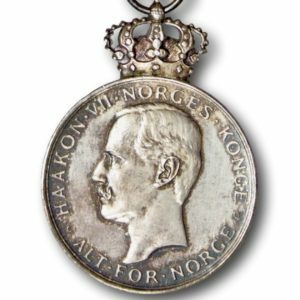 King Haakon VII’s Medal of Merit (1908-1957) awarded to John Herstad in 1915. Original box included. Both box and medal are in very good condition. Reference: Hallberg II 32. 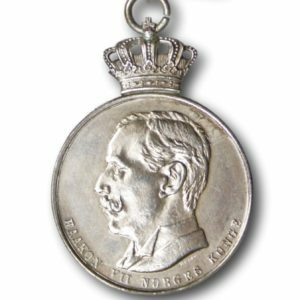 King Haakon VII’s Medal of Merit (1908-1957) awarded to Kristian Martinsen in 1948. Original box included. Both box and medal are in very good condition. Reference: Hallberg II 32. War Cross dated 1941-1949, established 23 May 1941. 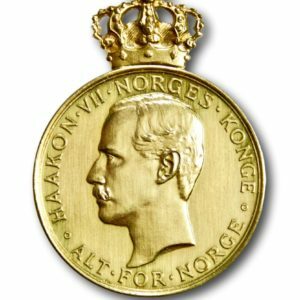 It is the highest ranked decoration in Norway and 276 recipients were rewarded this medal in the period from 1941 to 1949. The medal is in good condition and has a beautiful patina. Reference. Hallberg IV 1. 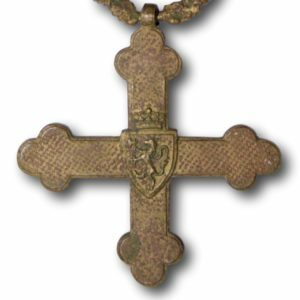 King Haakon VII’s Freedom Cross, established 18 May 1945. 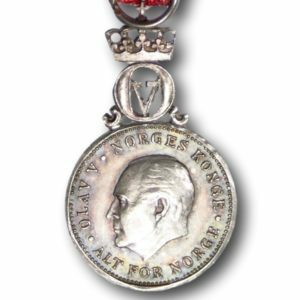 After World War II, 475 recipients were awarded this medal (66 Norwegians, 198 Britons and 211 Swedes). 6 additional recipients were added in 1988. The medal is in very good condition and the enamel is without damage. Reference: Hallberg IV 2.